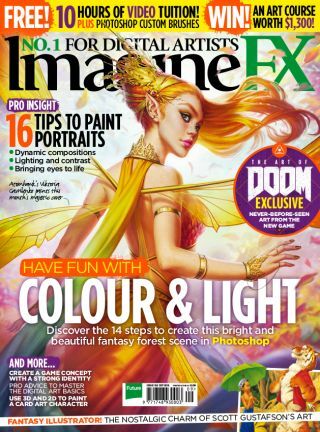 Boost your portrait skills, use colour and light effectively, and bring your character concepts to life – all in the new issue of ImagineFX. Atomhawk’s Victoria Gavrilenko colourful interpretation of Queen Titania, from A Midsummer Night’s Dream, is your gateway to this month’s ImagineFX. The issue is packed with art advice, starting with our Q&A section, which covers basic techniques in Photoshop and Painter. Then there’s portrait advice from Mélanie Delon and character concept tips from Rob Laro, while Stéphane Richard uses 3D and 2D software to create character card art. We also take an exclusive look at artwork from the latest instalment of Doom, talk to esteemed illustrator Scott Gustafson, and see how traditional painter Jeff Miracola uses scumbling and glazing techniques to illustrate a striking woodland character. Plus there’s over 10 hours of exclusive video tuition, custom brushes and layered PSDs for you to download. Subscribe today and save up to 47 per cent (based on a quarterly subscription), and get 20 per cent off the Adobe CC Photography plan (print and print + digital subscribers).